Teachers in the pre-K and primary grades seek to develop within children the capacity to follow instructional routines, maintain academic engagement, and acquire basic school-readiness skills. To help them to attain student success, primary classrooms frequently receive additional staffing resources in the form of reduced class size or assignment of co-teachers or part-time or full-time teaching assistants (Finn & Pannozzo, 2004). Yet students in these settings may waste as much as a third of instructional time transitioning between activities (Casey & McWilliam, 2005). Furthermore, primary classrooms staffed with teaching assistants typically show little or no improvement in student behaviors when compared with classrooms that lack assistants (Finn & Pannozzo, 2004). An explanation for why well-staffed primary-level classrooms often do not see expected gains in student behavior and engagement might be traced to how educators in those classrooms define their roles. In a traditional pre-K or kindergarten setting, for example, staff are often assigned to manage groups of students. At any given time, the teacher and teaching assistant typically work simultaneously with different groups, with each educator responsible for setting up and terminating their group activity. One negative consequence of this 'teacher-on-student' support plan is that any child with a behavior problem can temporarily stop instruction as the educator in charge of that group is forced to respond to the misbehavior. A second negative outcome is that students are idled during transitions while they wait for all adults to set up the next activity--a prime time for additional behavior problems. A final concern when educators tie themselves to groups is that transitions between activities must be imposed uniformly on all students, making few allowances for children who need longer transition times. An alternative means for organizing staff is to link educators to specific 'zones'. 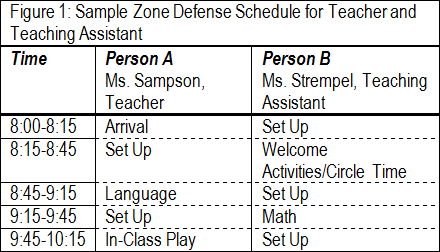 In this 'zone defense system' approach (Casey & McWilliam, 2005), two (or more) educators assigned to a classroom divide up the instructional day into 'zones' (defined here as instructional activities occurring at scheduled times in different parts of the classroom). At any point during the school day, one educator assumes the role of 'instructor' and actively teaches children within a zone. Meanwhile, the second educator takes the role of 'set-up', preparing for the next scheduled activity in another part of the room. Figure 1 provides a sample Zone Defense schedule. The actual schedule form is available in PDF or Microsoft Word format. greets students as they enter the new zone and helps each child to engage immediately in the current activity. engages in active teaching during the zone activity, providing instructional support to students. releases students at the end of the activity to move to the next zone activity. continues to support those students who need a longer transition time as they wrap up the current activity. cleans up and reorganizes the work space. sets up the materials and organizes the work space for the next scheduled zone activity. is available to pull any children from the current zone activity who are emotionally upset or misbehaving, help them to reassert behavioral control, and return them to the group. performs any other duty that prevents the current zone instructor from being interrupted. If a visitor enters the classroom, for example, the set-up person meets with them. is waiting in the new zone during the change-over between zone activities to greet students as they enter the area and to ensure that each child immediately starts the planned instructional activity. The most important benefits of the Zone Defense System are that it reduces student down-time, prevents the interruption of instruction, and also accommodates those children who need additional time to transition from one activity to another. However, an additional potential plus is that rotating primary responsibility for different zone activities among staff members ensures that all educators linked to the classroom--general educators, special educators, paraprofessionals-- work together as colleagues and that the talents of each will be fully employed.